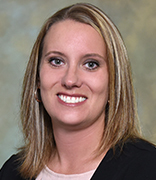 November 30, 2018 (Janesville, WI) – Blackhawk Bank is pleased to announce the addition of Anna Johnson, Mortgage Planner NMLS# 443885, to our Mortgage Team. Her office is located at 2525 Milton Ave., Janesville, WI. Johnson’s focus is on seeing her clients succeed when purchasing their first home, refinancing an existing property or finding their dream home. She’ll be with them every step of the way, from beginning to end. Johnson has been in the financial industry for nine years, with the most recent three years in Mortgage Lending. She stays active in the community working with NeighborWorks. She is a resident of the Janesville area, where she lives with her husband and two teenage sons. When not working, she enjoys spending time with her family and traveling. To learn more about how Anna can help you reach your mortgage goals, give her a call at 608-856-5503, email her at ajohnson@blackhawkbank.com, or view her mortgage page. Established in 1881, Blackhawk Bank has served individuals, families and business owners for 137 years. The Bank operates eight full service banking centers in Janesville and Beloit, Wisconsin and in Rockford, Belvidere, Machesney Park and Roscoe, Illinois. The Bank also operates a Business Banking Center in Elgin, Illinois and a Mortgage Processing Center in Roscoe, Illinois. Complete information about Blackhawk Bank can be found at www.blackhawkbank.com.